It rarely snows in Kyoto in spite of the cold climate. 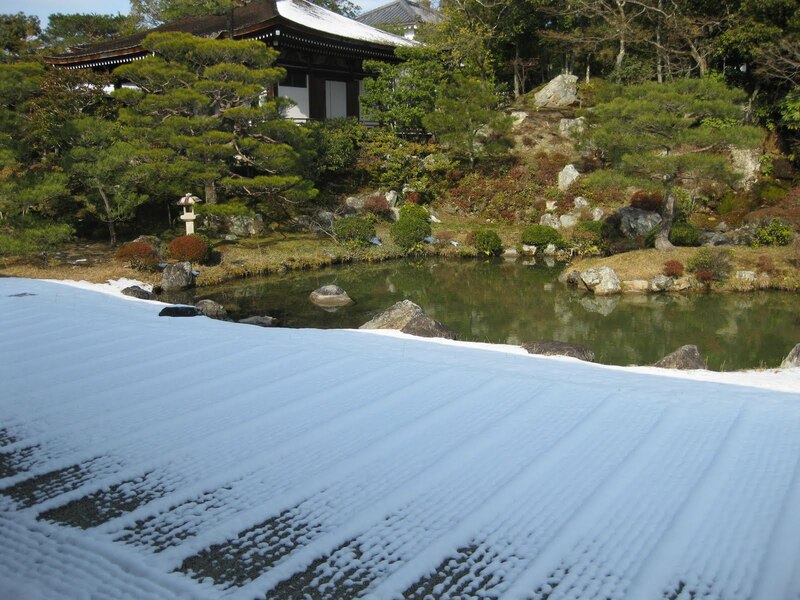 Even if it snows, the architectures and the gardens in Kyoto are seldom covered with snow. Tourists as well as the citizens have few chances to see the scene in the snow. The day before our tour it was snowing. And that morning, it was still very cold. I expected the scene with snow. After picking them up at the hotel, we headed for Arashiyama where it is comparatively colder than in the center of the city. That was, in a sense, BINGO! 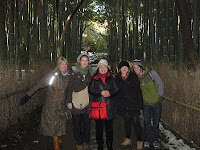 The first leg of our tour was Bamboo forest. When we got there, it was snowing. That was the first time for me to see Bamboo forest in the snow. Sometimes we saw the sunshine coming through among those tall bamboo trees. It was very impressive. We walked along the Hozu river. The mountains were also covered with snow. The air was clean, which made the scenary so beautiful. Then we went back to the city and visited Ninnaji temple. The sand in the garden was white, whiter than usual. 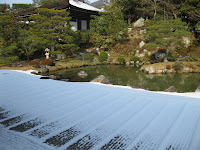 We enjoyed this garden and visited the next temple Ryoanji rock garden. This garden was very famous for the sand and rock garden. A half of the sand garden was in the snow. It showed me a different aspect from what I always see when I visit there as a guide. This temple obtained the paintings which it had lost a long time ago. They returned for the first time in about 100 years. Those paintings are being exhibited for a time being. I came to know this exhibition on the news, but that was the first time to directly see this artistic works. 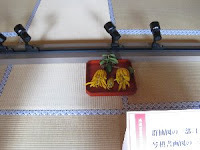 We found something yellow flower-like in front of the paintings. One of us asked me what it was. And I didn't know and haven't seen it before. In that case, I usually make it a rule to ask soembody in the temple, and I did so. It was a kind of citrus fruits called "Bussh", which means " a hand of Buddha" They say that we can see this just in this season in the year. It really convinced me. Actually they look like hands, don't they? I expected the snow covered the roofs of Golden pavillion. Unfortunately, we could not see the expected scenary. The front side of the architecture was toward the sun. It had a lot of sunshine in the morning, and when we were there, the snow on the roofs was no longer there. However, we did enjoy the beautiful sight! We tried OKONOMIYAKI for lunch. ( Actually they cooked it by themselves!) And the last leg was Nishiki food market. When it comes to trying something new, ( in the case of Nishiki market, it is usually Octopus), it will be a man or a boy. This time was no exception. He was forced to try it for taking a pic. But it was not so bad!! In fact, it is very tasty. Why don't you try it by yourselves???? One more attraction in Nishiki market is a soymilk doughnut, or soymilk softcream icecream. You should try them! They bought 23 doughnuts and my share of them were 3, or 4..probably. Needless to say, I got full! After their stay in Kyoto, they were going to go skiing in Nagano. 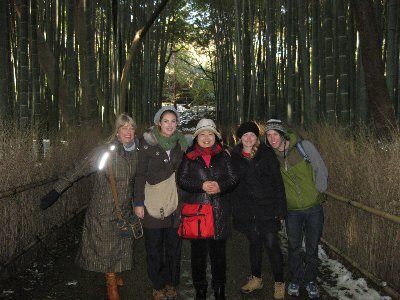 Tour : Bamboo forest, Togetu bridge, Ninnaji temple, Ryoanji rock garden, Golden pavillion, Nishiki food market. Hi! I love your blog. It's full of good information and explanation. What's more it's so instructive for me to read as an good journal for learning English. Thanks for sharing, indeed. Sorry for my late reply. I haven't noticed your comment. And thank you for giving me a comment. 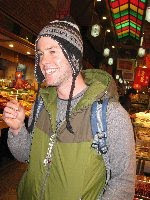 I will try to share some information of Kyoto as much as possible. Thank you, too.